Eye examinations are very different from office to office. During our comprehensive examinations, patients can expect to have all aspects of their visual system evaluated. This includes a patient’s ability to see colors, determination of their optimal prescription, evaluation of current contact lens fit and accuracy of contact lens prescription, ability of the eyes to focus and work together as a team, evaluation of visual fields (peripheral vision), and many others. In addition to visual needs, each patient’s ocular health is fully evaluated. This involves a thorough assessment of the outside parts of the eye and a detailed evaluation of the internal ocular structures like the lens, the optic nerve, and retina. The evaluation of a person’s ocular health is a critical part of a comprehensive examination because many potentially blinding eye diseases are initially undetectable to patients. Conditions such as glaucoma, macular degeneration, and diabetic retinopathy can all sneak up on a patient without warning signs. Early detection and treatment is the key to preventing visual loss. Most people have heard the saying that “the eyes are the windows to the soul.” It can also be said that the eyes are the windows to a person’s systemic health. Warning signs or changes from many systemic diseases often show up in the eye, allow us to evaluate a person’s overall health and assist their primary care physician in treatment. The bottom line is that comprehensive eye care is more than just a patient’s prescription for glasses. An annual eye exam is an excellent way to make sure that your eyes and body are healthy. Please have your medical and vision plan ID cards with you. Each plan covers different aspects of your care. Please contact us if you have questions about your coverage. If you are a new patient, please try to arrive 5-10 minutes in advance of your appointment to complete registration procedures. If you have already received these materials via mail or our website, please try to arrive at your scheduled appointment time. Anticipate having your eyes dilated. This will allow your ocular health to be fully evaluated during your examination. After your exam, expect a slight sensitivity to sunlight and an inability to focus for near work (ie. reading) for 2-3 hours. Although most patients are comfortable driving afterwards, we do recommend you have a driver available should you feel incapable and sunglasses for comfort. Expect to spend about 1 hour in our office for your comprehensive examination. This will include your exam, frame selection and fitting, and any registration/billing procedures. Please contact us if you have any questions or concerns about your eye examination. Vision disorders are a common pediatric health problem in the United States. It is estimated that nearly 25% of school-age children have vision problems. Despite the economic, social and health care advances which have occurred in our society, many preschool and school-age children are not receiving adequate professional eye and vision care. Only about one third of all children have had an eye examination or vision screening prior to entering school. Also, a recent study found that 11.5% of teenagers have undetected or untreated vision problems. Children with uncorrected vision conditions or eye health problems face many barriers in life: academically, socially, and athletically. Professional eye care can break down these barriers and help enable your children to reach their highest potential. Diabetes in the leading cause of blindness in the United States for patients aged 25-60. The majority of diabetes-related blindness, however, is preventable with proper care involving a coordinated effort between our office and your primary care physician. Click here to learn more about diabetes and the eye. If you have diabetes, please call or schedule an appointment on-line today. With over 40 years of contact lens experience, our office specializes in the “hard-to-fit” patient (i.e. keratoconus, astigmatism, bifocals, post-surgical, etc.) and patients that have been previously told that they cannot wear contact lenses. Our office handles all contact lens materials (etc. soft, gas-permeable), technologies (ie. SynergEyes, Corneal Refractive Therapy) and brands. Now you can enjoy clear vision with freedom from traditional contact lenses and eyeglasses during your daily activities without undergoing surgery. Recent clinical research combined with the latest corneal surface mapping technology, computerized manufacturing and space age oxygen-breathing materials have brought new science to corneal reshaping. Corneal Refractive Therapy is a non-surgical process clinically developed to reshape the cornea while you sleep. The result is the temporary correction of myopia (nearsightedness) with or without moderate astigmatism (irregular surface of the cornea). Because Paragon CRT offers freedom from glasses and wearing contact lenses during the day, this leading-edge technology can enhance the lifestyle of people requiring vision correction. Active individuals can freely participate in sports without the interference of glasses or bother of contacts. Eye irritation or dryness sometimes associated with contact lens wear due to outside dust and pollutants is eliminated. Both our doctors have achieved certification (an FDA requirement) to fit Paragon CRT lenses making them part of a select group of practitioners. How does Corneal Refractive Therapy work? Paragon CRT contact lenses for Corneal Refractive Therapy produce a temporary reduction of near-sightedness by changing the shape (flattening) of the cornea. Contact lenses rest gently on the cornea, separated by a layer of tears, and can influence the corneal shape. Regular contact lenses are designed to nearly match the shape of the cornea and thereby cause little or no reshaping effect. Paragon CRT contact lenses for Corneal Refractive Therapy are not designed to match the cornea’s shape. They are less curved than the cornea and designed to apply gentle pressure to the center of the cornea. When the cornea is flattened, the focusing power of the eye is reduced to bring the eye into correct focus and compensate for near-sightedness. Paragon CRT therapeutic contact lenses are worn overnight. After the lens is removed, the cornea retains its altered shape for all or most of your waking hours. Is Corneal Refractive Therapy right for me? Paragon CRT contact lenses are indicated for patients who want to see clearly during their daily activities, free from contact lenses or glasses. Paragon CRT is ideal for occupations that require exposure to smoke, noxious gases, or conditions of low humidity. These lenses are appropriate for myopic (nearsighted) individuals up to -6.00D, without or with up to -1.75D of astigmatism. However, you must be evaluated by a Paragon CRT certified eye care professional to determine if you are a candidate. As our doctors examine your eyes, they collect data used to analyze the surface of your cornea. This data is then skillfully interpreted and Paragon CRT lenses are specially designed for you. Your prescription lenses are manufactured using a computer-controlled system, which produces accuracy to a precision level of six microns of tolerance – approximately half the width of a human hair! Paragon CRT is a unique rigid gas permeable contact lens design temporarily correct myopia (nearsightedness) by gently and reversibly reshaping your cornea while you sleep. You may then be able to go throughout the day without any lenses. Paragon CRT lenses are made from an overnight contact lens material in a special design intended for this purpose. Can everyone wear Paragon CRT™? Not everyone can wear Paragon CRT. This lens is intended for individuals with low to moderate myopia (nearsightedness up to -6 diopters) and moderate astigmatism. During the U.S. clinical study 121 subjects of the 205 enrolled completed nine months of lens wear. CRT is not painful. Initially, you may have a slight awareness of the therapeutic lens. You will not feel the lenses when you sleep and there is no sense of physical corneal change….just visual improvement when the lenses are removed. Can I see with the CRT lenses on? Yes. One of the great features of the Paragon CRT lens is that if you have to get up in the middle of the night, you will be able to see where you are going. And if during the initial treatment phase you find that you need some form of vision correction, you can put in your lenses are see clearly. How do I care for my lenses? Your lenses should be chemically disinfected after every use (not heat). Our office will instruct you about what care system is best for you. Your lenses should be replaced as recommended by our doctors. How likely is it that Paragon CRT™ will work for me? Of the 159 eyes targeted for 20/20 vision (who had this acuity with their best glasses), 59% obtained 20/20 or better without other correction and 92% obtained 20/40 or better at 9 months. (20/40 vision is the acuity required in most states to drive without glasses). 67% Of the subjects obtained 20/20 vision in at least one eye (their better seeing eye) and 94% achieved 20/40. Most patients have rapid improvement in the first few days of treatment and have achieved nearly their optimum vision in 10 to 14 days. A small percentage of patients will not improve enough to function under all conditions without additional correction. No, it is temporary. If you stop wearing the lenses regularly while you sleep your vision will return to its original state in as little as 72 hours. What are some important things for me to remember? If you feel like you are having a problem with your vision or contact lenses, immediately remove your lenses and call our office. Always follow the instructions our doctors have given you about lens wear, follow-up and care systems. What are the risks of wearing Paragon CRT™? There is a small risk involved when any contact lens is worn. It is not expected that the Paragon CRT Contact Lenses for Corneal Refractive Therapy will provide a risk that is greater than other rigid gas permeable contact lenses. Because this procedure is reversible some patients may notice changes in their vision late in the day. The two most common side effects that occur in rigid contact lens wearers are corneal edema and corneal staining. It is anticipated that the same side effects will also occur in some wearers of Paragon CRT. Other side effects that some- times occur in all contact lens wearers are pain, redness, tearing, irritation, discharge, abrasion of the eye or distortion of vision. These are usually temporary conditions if the contact lenses are removed promptly. In very rare instances, infections of the eye, corneal ulcer, iritis, neovascularization, corneal scarring, or permanent decreased vision may occur. The occurrence of these side effects should be minimized or completely eliminated if proper lens care is exercised. What do I do in the period of time between when I start Paragon CRT™ and when I achieve treatment? It is important to understand that for a time after you have begun beginning treatment but before sufficient treatment is realized, your old glasses will no longer be the appropriate prescription. Our doctors will discuss what your options are for visual correction during that period of time. What if I have questions about Paragon CRT™? It is essential that you discuss any issues you may have about your eye health or contact lens wear with our office. If you need any further information about Paragon CRT, please contact our CRT coordinator by telephone at (518) 563-5460 or through our website. Our doctors are trained and licensed to diagnose, treat, and manage ocular diseases, infections, and inflammations with pharmaceutical agents. Patients with glaucoma, diabetes, macular degeneration, intraocular inflammations, corneal disease, retinal vascular disease, and many other conditions benefit from the personalized care they receive in our office. FirstView Eye Care Associates is proud to utilize the latest high-resolution OCT technology. Our office utilizes the latest technology in corneal mapping and corneal thickness analysis to provide our patients with the highest quality pre-surgical screenings and post-operative care. Our location also offers a convenient alternative for pre and post-operative care for local patients who choose to have surgery elsewhere in the Northeast or Canada. Patients with the eye condition keratoconus have special eye care needs. With over 40 years of caring for patients with keratoconus, our office excels in handling those needs. We utilize the latest technology in digital corneal mapping and contact lens design to provide the sharpest, most comfortable vision possible. Keratoconus is an ocular disease that causes the normally round cornea (the front part of the eye) to become thin and irregular (cone) shaped. This abnormal shape prevents the light entering the eye from being focused correctly on the retina and causes distortion of vision. What are some symptoms of keratoconus? In its earliest stages, keratoconus causes slight blurring and distortion of vision and increased sensitivity to glare and light. These symptoms usually appear in the late teens or late twenties. Keratoconus may progress for 10-20 years and then slow in its progression. Each eye may be affected differently. As keratoconus progresses, the cornea bulges more and vision may become more distorted. In a small number of cases, the cornea will swell and cause a sudden and significant decrease in vision. The swelling occurs when the strain of the cornea’s protruding cone-like shape causes a tiny crack to develop. The swelling may last for weeks or months as the crack heals and is gradually replaced by scar tissue. If this sudden swelling does occur, your doctor can prescribe eyedrops for temporary relief, but there are no medicines that can prevent the disease from progressing. How can a doctor help a person with keratoconus see clearly? Eyeglasses or soft contact lenses may be used to correct the mild nearsightedness and astigmatism that is caused by the early stages for keratoconus. As the disorder progresses and the cornea continues to thin and change shape, gas permeable contact lenses can be designed to correct vision adequately. This requires a great deal of skill and expertise on the part of the doctor. The contact lenses must be carefully fitted, and frequent checkups and lens changes may be needed to achieve and maintain good vision. 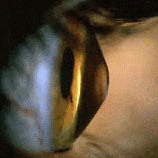 In a few cases, a corneal transplant is necessary. However, even after a corneal transplant, eyeglasses or contact lenses are often still needed to correct vision. Up to one-half of Americans suffer from some type of allergy. Many of these people also experience the ocular effects of allergy (itchy, watery, red eyes). Although most ocular allergies are not vision threatening, they’re uncomfortable and very often interfere with daily activities. Many people with seasonal allergies take a systemic medication to minimize their symptoms. Some of these medications (ie. Antihistamines) can decrease a person’s normal tear production. This situation can often make the problem worse because our tears normally act as a “shield” and wash away many particles that can irritate our eyes. The result is a decreased defense against eye allergies. Contact lenses frequently create additional problems for people with allergies by collecting and trapping irritating particles such as pollen and proteins. For those reasons, the most effective way to manage the ocular effects of allergy is with topical medications (eye drops) and/or modifications of a contact lens wearer’s lens material. Fortunately, there are numerous eye medications and contact lenses specifically designed to make allergy season much easier for people to endure. Don’t continue to suffer through another season of itchy eyes when help is available. Dry eye syndrome is an extremely common condition, thought to affect approximately 60 million Americans. The cause is usually unclear, but there appears to be an imbalance between tear production and tear evaporation/drainage from the eye. People with dry eye syndrome usually experience stinging, redness of the eyes, and tearing. Dry eyes can also make ocular allergies more severe and bothersome. In most cases the cause of dry eye syndrome is unknown. However, certain diseases and medications may be associated with dry eye. Contact lens wearers, patients with rheumatoid arthritis, and those individuals who take antihistamines (for allergies) probably represent the largest groups of patients with a known cause for dry eye syndrome. A large number of other conditions and medications may also be associated. Dry eye syndrome is an ongoing condition that cannot be cured, but the accompanying dryness, scratching and burning can be managed. Never have there been more options for people suffering from dry eye symptoms. Artificial tear solutions and gels represent the most basic form of therapy. However, if repeated artificial tear use does not seem help or becomes an inconvenience, occlusion of the tear drainage system can be performed. This procedure is quick, simple, and often very effective in helping to relieve dry eye symptoms, even in the most severe cases. Additionally, new prescription medications, like Restasis, have been formulated to treat the underlying causes of dry eye and promote tear production. If you think you have dry eye syndrome or have been told that contact lenses are not an option for you due to dry eyes, we can help.